This is the card I made for Wanda...sorry for the horrible picture! I realized that I need to give it to her tonight, and they still have our camera, which they used to take pictures of the funeral yesterday. (I have gotten used to a lot of cultural differences here, but sorry...that is not one of them...) Anyway, the only camera in the house is on my cell phone. The stamps used are Roses in Winter from Stampin' Up (scored in an unmounted lot of stamps on ebay), and some stamps I designed myself and had pressed by Village Impressions. I used a flourish stamp from Stamp Camp on the card base (stamped with Versamark ink). You can't tell in the picture at all...but the floral panel is shimmery cardstock, then I used the glue pad successfully with some Perfect Pearls. There is glitter glue on the small flower centers too. Not very me, truly...but very cultural, I must say. The saying literally means "we join with you in your grieving". It's beautiful. I'm sorry for their loss. Sending prayers your way. This is beautiful. I am sure the family will appreciate this, and appreciate the face that you are joining them in their grieving. This is just beautiful and so special to have the Indonesian words as well. 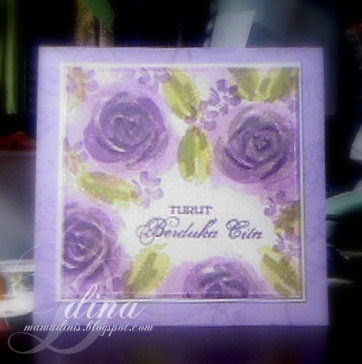 Beautiful card, so soft and serene. Sorry you actually have to use it but it is sure to bring comfort. It's obvious that it came from your heart.